The first traditional quilt I pieced. 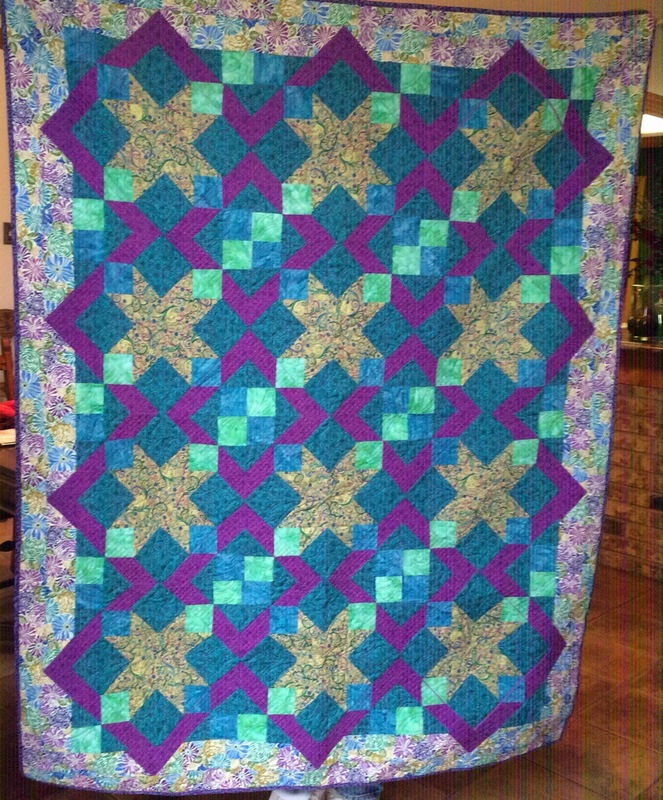 Here is a photo of the first quilt I ever pieced. I wanted to learn how to use the advanced features of auto fitting and cross hatching of the Innova Autopilot and I was bored with using el cheapo walmart $2 sale fabric whole cloth practice quilt sandwiches. So I decided to use a quilt top that I had made which I didn’t care if it got messed up. Having been in my closet for about three years, when I got past the initial learning phase with my longarm, I thought that my first piecing should be my first long arming too (especially since it wouldn’t bother me if I messed it up.) While pretty colors, this color combo just isn’t me. And neither is the calico print type of fabric. I had also screwed up in cutting and had to substitute some of the fabric (the aqua squares). So, I had never bothered to finish it by quilting the top to batting and a back. I bought the quilt pattern and kit on sale, because I wanted to learn how to piece and this looked kinda intermediate in difficulty. Turns out the directions were great and so it was pretty easy to make. It was from a kit put together at The Quilt Haus in New Braunfels, Texas. The pattern is Starshine by Creative Sewlutions. It is also the most difficult quilt that I quilted on my Innova Longarm so far. Previous Previous post: I am so not the Queen of Organization, but this organizer rocks!